Are you on a diet and craving for your favorite chocolate cookies? Here's the solution! 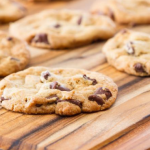 Try this Low Carb Chocolate Chunk Cookies recipe. Chewy, lightly crisp and customizable to your taste buds! Mix dry ingredients together (almond flour, coconut flour, psyllium husk, baking powder, whey protein). Beat room temperature butter together until light in color then add erythritol and stevia and beat again. Add egg and vanilla extract and beat again until fully combined. Then, sift dry ingredients over wet ingredients and mix together. Chop 5 bars of choco perfection into chunks and mix into dough. Roll dough out into a log and cut into 16 slices.Roll dough into balls, place on a silpat, then press with the base of a mason jar. Bake for 12-15 minutes, let cool, and enjoy!